What is the first thought that strikes your mind when you hear about "Blogging on Postcards" - PostSecret ? 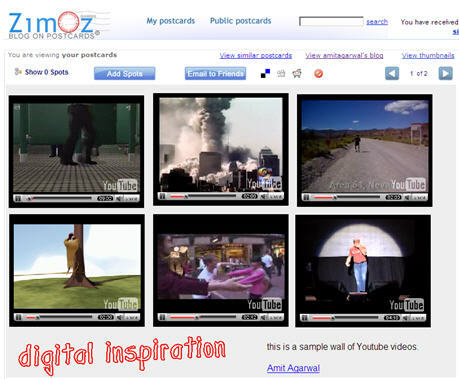 But Zimoz "Blog on Postcards" service is something very different from PostSecret. Zimoz is like a drawing canvas (they call it a postcard) where you can drag-n-drop elements including text, photos or even Youtube videos. The "postcard" can then be shared with others using a public URL. All your public postcards also become available as a blog on Zimoz. The service may not appeal much to tech-savvy bloggers but the real exciting part was adding videos from Youtube to Zimoz - add the video(s), drag them anywhere on the screen or resize with the mouse pointer. Here's a Youtube wall as a blog postcard of all our favorite Youtube Videos. Want some more fun ? just play all the videos simultaneously.